It has been raining for weeks. Where once there were streams there are now rivers. Where once there were rivers there are now people’s living rooms, their framed pictures and old vinyl floating in flooded cellars. And on a grim Saturday night in socialist members’ club The Trades Club (est. 1923, sponsored by neither beer company, energy drink nor phone network) where there should be bodies there is the occasional gap in a crowd, left by people stranded in their hill-top hamlets, unable to make it down to see one of the few guitar bands in Britain today worth leaving the house for. Hebden Bridge has been described as “a drug town with a tourist problem”, a place that has reinvented itself from the soot-blackened, post-industrial nowhere hole of the 1960s into a place of radicalism, where non-corporate small businesses thrive, old anarchists reminisce and ex-hippies and punks come to age disgracefully. A small Labour Party-owned club run by committee along strict ethical lines but a relaxed and welcoming door policy seems the perfect venue in which to see a band with radical streak and who, like the best of their musical ancestors, continue to divide opinion. 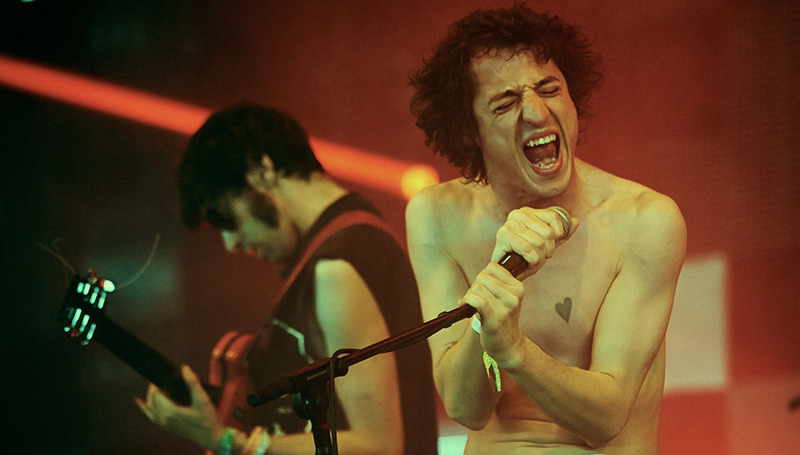 A lot of music fans I know – people who pride themselves on being true music heads - hate Fat White Family. They say they have seen it all before and dismiss them as hip scenesters (though any scene they are part of is surely self-created), conveniently forgetting that most fifteen year old kids who growing up on Yorkshire farms or in the suburbs of Middlesbrough or in a brutalist tower block in East Kilbride have not. Guitarist and band founder Saul Adamczewski – an individual who resembles a rickets-stricken Dickensian street urchin in dire need of a second, third and fourth bowl of gruel - is missing tonight, replaced by Dale Barclay from the late, great The Amazing Snakeheads. Dale has a face like a flick-knife and sweats meth; he’s also one of Scotland’s great unknown rock stars, Alex Harvey-meets-Franco Begbie. When he screams in the face of keyboardist Nathan Saoudi from the distance of two inches, the latter looks genuinely scared for his life. Tonight Fat White Family remind us that rock ‘n’ rock just about still exists – as a concept, a lifestyle, an anti-authoritarian philosophy. It’s easy to feel that the marketing men who have sucked the blood out of NME and replaced the ancient pagan fuckfests of olde England with Jo Whiley spaffing over some stage school dobber live on the red button have indeed won the war. Clearly rock music is in its dying days as we slip into a cycle of repeated ideas with diminishing returns, but the pulse-beat is nevertheless still there beneath Fat White’s translucent skin. One arrives at a gig like this with preconceptions and doubts. Because, yes, I’ve seen Black Sabbath. Hell, I’ve drunk Ozzy’s wine, smoked his tabs and shot his guns. I’ve witnessed Iggy in full flight, watched The Fall at close quarters, seen LA with Jane’s Addiction. I’ve danced to Fugazi in DC. I namedrop these only because Fat White Family match all of the above. They are just as dangerous, just as heavy. Often I pity the teenagers of today, forever having to listen to old bores bang on about these greats; not tonight though. Tonight young bucks and old gig-goers are united by a sense they are seeing something unnerving and rare. The funereal death-moan choral drones of ‘Auto Neutron’ and the stark blood-red lighting set the mood for a performance that oozes anxiety and genuine malevolence. There is something shamanic and ritualistic about the waves of sound emanating from the stage as suedehead singer Lias Saoudi (a squat-punk Serge Gainsbourg) arrives brandishing grapes and wearing what appears to be a smeared pomegranate on his face, and around him the six members lock into a heavy, psychically-charged mental state that permeates every song, pulls you forward, pulls you under. A fifty year old friend – a soundman who spends half of every year on tour and is friend of many a fried psychonaut – admits to being “scared and confused.” He says that were the venue seated, he would have ripped them up and thrown them stagewards, just like the outraged fans who watched Bill Haley in Rock Around The Clock back in 1956. He reckons the Fat Whites are “definitely a bunch of cunts” and he hasn’t felt this threatened at a gig in a long time. Who wouldn’t want to see a band described this way? When a big pissed lummox in the crowd attempts to grab Barclay’s guitar during the “ballad” ‘Goodbye Goebbels’ (it’s not a ballad – it’s a brain shattering comedown) a small, shirtless speccy fan half his size steams in and windmills the big brute to the floor; it is mosh-pit policing of the most surreal order. Otherwise the crowd is comprised of people of all ages magnetically-drawn in, full of joyous love and any initial scepticism jettisoned as the band lurch into ‘Is It Raining In Your Mouth?’, an anthem for the disenfranchised, Cameron-shafted generation whose architecture is couplets such “Hell hath no fury like a failed artist / Or a successful communist”. And that’s something else that the Fat White haters often overlook - Saoudi’s lyrics are fantastic, occasionally stripped down to the point of banality, but at other points poetic and hilarious, such as when he boasts of getting blow-job from one of the Holocaust’s most eminent literary survivors, Primo Levi. The newer tracks from forthcoming album Songs For Our Mothers - the kosmiche-powered ‘The Whitest Boy On The Beach’ and the petulant stomp of ‘Satisfied’ - sound so much better when delivered live. The groping perv croon of closer ‘Touch The Leather’ is cranked up a gear to send us off spinning into the sodden streets of a cold night in northern England – Fat White Family’s true heartland – with images of bare buttocks and dangling ball-bags swinging pendulously across our third eyes. And that, perhaps, might be Fat White Family’s only failing: really they are a live band, whose sense of malevolence and danger can never be truly be captured on record. They exist in the moment, throwing shapes, framed in strobe, drawing blood. Screaming into the void of dying 21st culture rock culture. Clearly Fat White Family are not the start of something new. They are the end of six-plus decades of rock music marching to its violent death; their output a threnody for the fallen, a flame-dance across the corpses of Darby and GG, a series of curses aimed at those intent on taming the beast for commercial means and every other drippy prick who has turned the ownership of a Telecaster and a trilby into a commercial strategy, a pension plan. Unlike their forefathers Fat White Family can’t last; nothing this good ever does. They are not the Rolling Stones. They can’t afford blood transfusions. If they survive another year or two it’ll be a miracle. And when they’re gone we’ll anoint their bodies and throws roses on their corpses. Because tonight was special. And, for an hour or so, belief was restored.